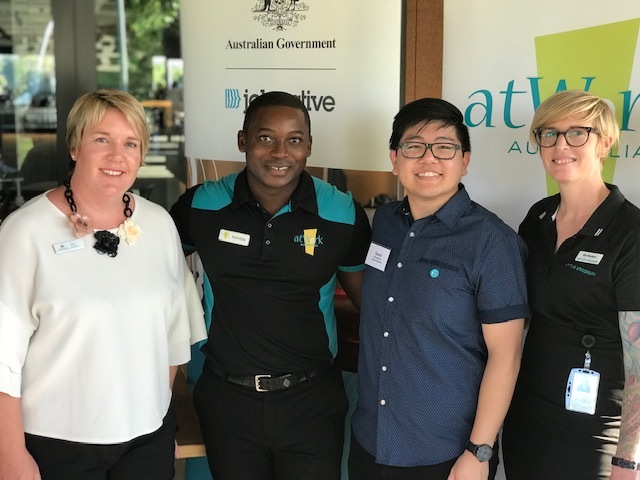 From left to right – Alix Roberts from The Department of Jobs and Small Business, Kalusha Chulu from atWork Australia, David Chen winner of the Optus Stadium ‘YES’ Awards, and Zoe Sanders from Optus Stadium. PERTH – atWork Australia recently held another successful atWork Network event at The Camfield in Burswood, as part of a networking series for local Perth employers. This event series continues to grow and was attended by more than 60 representatives from small and large businesses, including owners, managers and Human Resources professionals, across a diverse range of industries. Guests heard from Alix Roberts, Employer Liasion from The Department of Jobs and Small Business; Zoe Sanders, Event Staffing Operations Manager from VenuesLive; and Optus Stadium’s “Yes” award winner, David Chen. All three presenters reflected on the benefits for businesses and employees that come from helping Australian people find meaningful employment. Mark Burns, Executive General Manager at Programmed was the lucky door prize winner and in a very thoughtful gesture Mark donated his $500 Ticketmaster Voucher to David Chen, after being inspired by hearing his story. “David’s story of struggle and eventual success in employment really resonated with me,” said Mark. “David demonstrated determination not to give up and the flexibility to adapt to a career path that he might not have initially seen as his way forward. All the while maintaining a sense of humour. Our next generations are likely to need to be adaptable and resilient as the world changes quickly around us, so David is clearly off to a good start. Thanks David for sharing your story”. The atWork Network is part of a networking series that atWork Australia is dedicated to hosting throughout the year. atWork Australia is committed to providing excellent employment support services, making a real difference to people’s lives and helping employers to find truly great people for their business.